As we headed back into Sorrento at just after 10am on Tuesday morning, we passed one of those electronic signs outside a pharmacy on the main Piazza that had the temperature on. ; 40 degrees. 40, at 10am? Mamma Mia! Good job we would be taking it easy for the day. We were heading back to Ercolano Bar first of all to meet the rest of the hens & stags before making our way to our destinations for the day. 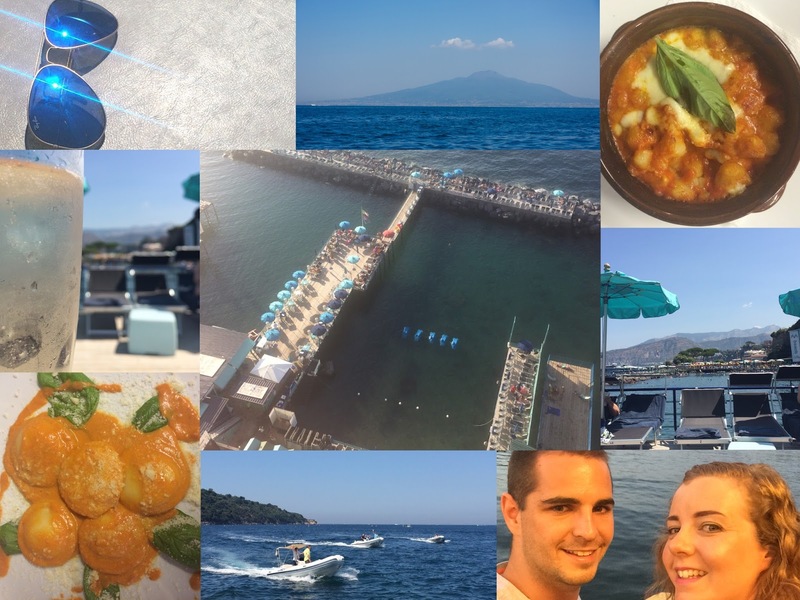 The Stags had hired speedboats for the day and we’re heading over to Capri for pizza and beer, whilst the ladies and little ones headed to Marameo Beach – a private pontoon, decked with sun loungers and parasols for a day of sunbathing and cocktails on the Thyrrhenian Sea. Marameo is just a short walk from the main Paizza in Sorrento and you can either zigzag your way down the cliff face via the Villa Comunale or take the slightly longer route down to the Via Luigi de Maio towards Marina Piccola. Or if you’re feeling particularly lazy you can the Sorrento Lift down from Villa Comunale straight there (which is what I did coming back as it was too warm to walk) and it only costs €1 (or €1.80 return). Upon arrival we were shown to our loungers and as part of our group booking we had towels and parasols included for us along with lunch and a soft drink. I was expecting the drinks to be expensive thanks to Marameo’s luxurious feel. However, I was pleasantly surprised with cocktails and Prosecco coming in at around €8 each and large bottles of water at €4. Our every need was catered for by the Marameo staff, we had a waitress on call all day for drinks, lunch was served to our loungers (I had a perfect Pizza), there were activities you could do on the seafront too such as kayaking and it has two private beach areas to cool off in. After spending almost 6 hours lounging around it was time to part our ways for the day and after doing a little shopping & having a well needed drink I caught up with Paul after his speedboat adventure and headed back for a quick change and freshen up before tea. We were warned by a local barman that the taxis in Sorrento can be quite expensive and it is wise to ask before you get in how much it will be. To our hotel in the Sant’Agnello it was €20 which isn’t too bad thinking to some of the prices you can be charged in the UK for similar length journeys. On his travels earlier that day, Paul had spotted Ruccio Ristaurante down on the Marina Piccola and we decided to head back there for tea. We picked out a couple of starters to share (Ravioli & Gnocchi) and then whilst Paul continued his carbohydrate overloaded with a Tuna Pasta dish, I chose a Porchini Mushroom Fillet steak and a Mojito. The Ravioli at Ruccio’s was one of the standout meals of the trip, as it was beautifully cooked, presented and just the right portion size. Ruccio offer a free shuttle service as well so they will pick you up from your hotel and drop you back if you call them beforehand, or if like Paul & I you are leaving whilst the shuttle is around they will save you the walk back to town and recommend the best Gelato stores in town. We got the driver to drop us back in the Piazza and go in search of Gelato, striking lucky at the Gelateria Snack Bar on Corso Italia who serve Lacto free Gelato at €2.50 for a small cone with 2 scoops – I had Nutella & Amaretto, a strange but wonderful combination that I savored for far too long as we headed back for the hotel shuttle bus.